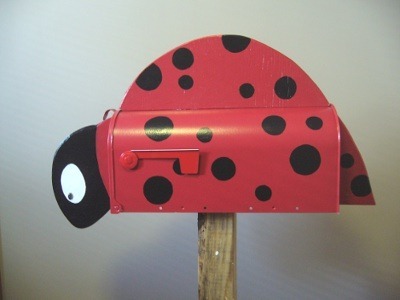 Each LADYBIRD Mailbox is customized with a decorative wood figure, which I have designed, fabricated and individually handpainted.I use high quality acrylic paints, and three coats of paint are applied to the figure and to the painting on the mailbox to ensure long life. Since each figure is hand painted and unique, there will be minor variations. I use Made in USA steel galvanised mailboxes, which meet USPS regulations. * n.b. The support or post below the mailbox is not include. They are appropriate for the Holidays, weddings, birthdays, housewarmings, graduation, corporate, teacher, romantic, gift ideas for him or her Mother’s Day, Father’s Day, Christmas or for someone special!
" Also, you can personalize your decorative mailbox with name or address number."